Heritage Walk Project: Completed by Birkenhead Town Centre Association Inc. Photo courtesy of St Andrews Presbyterian Church. Copywriter; Louis Prouting. After a visit to the Birkenhead area by Rev. Isaac Jolly in July 1911, he expressed the hope that “at no distant date a new church will be erected at Birkenhead to meet the needs of that growing district”. Earlier, in February 1908, Mr E Clark reported to a meeting of the Northcote Board of Management that a section had been selected at Birkenhead and moved that it be secured for a church site, at a cost of £100. 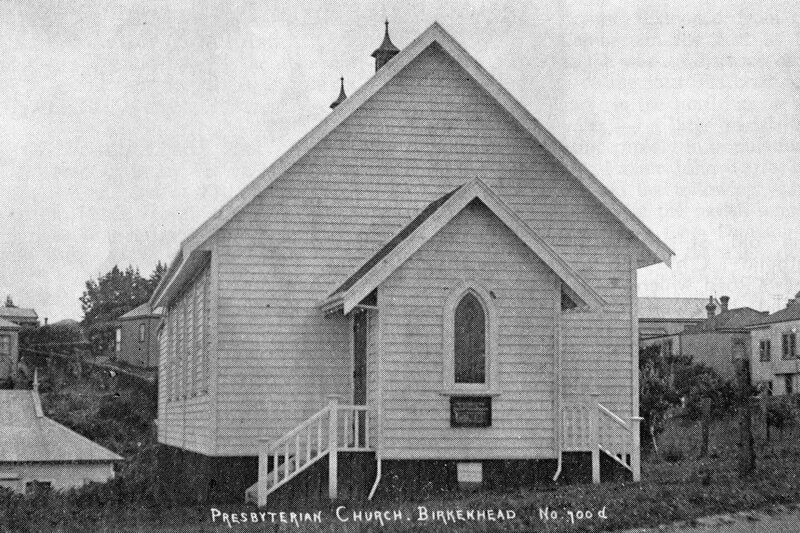 The site for the Birkenhead Church in Crescent Road (now 28 Mariposa Crescent) was transferred to the Presbyterian Church of New Zealand on 6 November 1909 at 12 noon. A report in the NZ Herald on 17 November 1914 says that “On Saturday 14 November the foundation stone was laid by Mr J.W. Stewart Esq., in the presence of a large gathering”. The church being built was to be of wooden construction, measured at 45 feet long and 25 feet wide, the seating capacity of 200 adults. The first service in the church was held on the 13th of December 1914. In August 1928, a new site for the church became available through S. Vaile and Sons, for £400. The decision was made to shift the church to the site instead of retaining it for a future manse. On December 9 the first services in the relocated building were held. This is the site where the church stands today, at 172 Hinemoa Street, Birkenhead. After being put to vote in 1932, the church was named after Saint Andrew, the Patron Saint of Scotland. St Andrew’s Presbyterian Church is still highly active today, as the meeting place for the Presbyterian section of the Birkenhead community.